The Office for Young People is an Archdiocesan office. We minister to young people from 16 to 35 years of age. We seek to raise up a generation of young people passionately in love with Jesus and His Church and committed to a lifestyle of discipleship and communion. We hope that you'll make yourself at home here and explore. Don't be a stranger and do check back for news on our upcoming events, encouraging testimonies and more! For more on our various areas of ministry, please click on the relevant age group. For NS Men and NS enlistess. For more information on how to get in touch, please click the icon. For more information on how to get in touch, please click the icon. To find out more, click on the icon! To find out more about our communities or get connected, click on the icon. Stay updated on what's going on here at OYP. Browse the categories for the events that interest you. Hello dear friends! Please note that we are moving Nox Gaudii from 26 April to 3rd May 2019. Mark the new date in your calendar and begin to ask the Lord who He wants you to invite to Nox Gaudii! A university freshman gathering to help students prioritize their faith as they begin their university studies. Students heading overseas for studies are also welcome. Interested to do overseas volunteer work or go on a mission trip? Come learn more overseas humanitarian work at the CHARIS Humanitarian Forum & Fair on Saturday, 1st June 2019 at Catholic Junior College. Visit CHARIS website at www.charis-singapore.org/hff2019 to register via online. For more information, call 63374119 or email HFF@charis-singapore.org for details. Click HERE or on the image above to download our calendar. 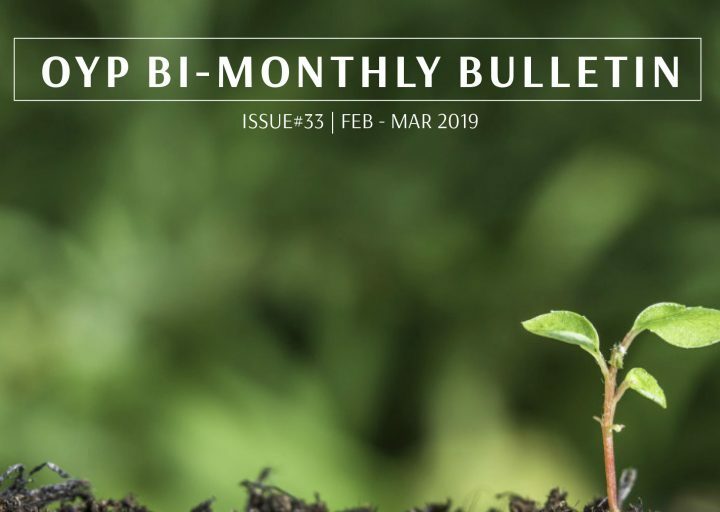 Check Out Latest Bulletin Issue! Click HERE or on the image above to read our Feb-Mar 2019 issue. Stop by and check out our latest earworm.